The first episode is set in the first centuries of the Islamic era and ends with the downfall of the Tang dynasty, which also marks the end of direct trade with China along the Maritime Silk Road in early Islam. At this time the Omanis are well-established sea traders and merchants with a network of partners for the acquisition and distribution of natural resources and manufactured products. With their level of sophistication and cosmopolitanism, Omanis welcome Islam as compatible with and beneficial to their society and culture. Their sense of morality establishes their reputation as esteemed trading partners. The story is told from the perspective of the Omani merchant Abu Ubayda Al Qassim, who is mentioned in an Arabic chronicle written in the 3rd C. AH / 9th C. AD, citing his birthplace as a village near Bahla. Omani seafarers develop commercial and diplomatic relations in China. 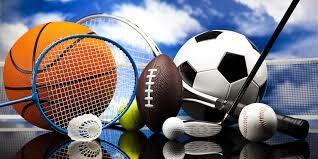 Through their fair and equitable trading, the Arabic merchants are trusted and welcomed there. They develop long-term relationships, including inter-marrying, and they introduce elements of their own society, including religion. The sensational finds of the Belitung shipwreck, which prove the existence of direct trade between Arabia and China in the early Islamic era, are also featured in this episode. 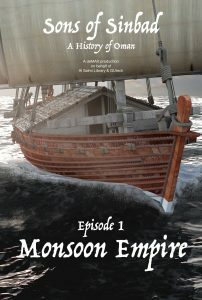 The second episode begins when the Portuguese arrive at the coast of Oman at the beginning of the 16th century. The important coastal cities of Oman come under the control of the Estado da India. Trade of spices and pepper is strictly regulated, Omani merchants need to get and pay for a cartaz – a permission to trade. It will take more than a century for Omanis to build up forces strong enough to resist and fight the Portuguese. When the last bastions of the Europeans at Muscat surrender in January 1650, the occupation finally ends. 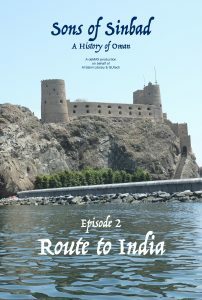 With the help of international experts and scientific research, the episode attempts to solve the secrets of this historical encounter: How did the Portuguese succeed in securing the route to India? Why was it so easy for the forces from Portugal to take possession of the Omani coast? And to what extent did the foreign occupation effect political and economic developments in Oman? Covering a period from 1840 to the present, the film combines on-location footage with reenactments and archival material to discuss the cultural and material exchange between the Sultanate of Oman and East Africa. 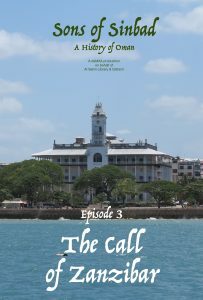 Focused on the events taking place on the Zanzibar archipelago, the episode emphasizes the reign of Sayyid Barghash (1870-1888) to describe what can be called the Zanzibar renaissance.